In his sleeve note for Bill Laswell’s legendary 1991 recording of the Master Musicians of Jajouka William Burroughs exhorts the listener to “Listen to this music, the primordial sounds of a 4000 year old rock 'n roll band... listen with your whole body, let the music penetrate and move you, and you will connect with the oldest music on earth”. Burrough’s references to “a 4000 year old rock ‘n roll band” and “the oldest music on earth” are derived from the suggestion by the eminent Finnish sociologist Edvard Westermarck that the Jajouka musicians' wild music has its roots in ancient Greek Dionysian rituals. There is no doubt that Burrough’s prose is one of the finest examples of the lost art of sleeve notes; but there is one problem – the Jajouka sound is not the oldest music on earth. The Copts, who are the indigenous Christians of Egypt, believe that they are the direct descendants of the pharaohs. As the first pharaoh King Narmer ruled around the 31st century BCE, this dates the start of the Coptic lineage and its music more than a thousand years before the Dionysian rituals that gave birth to Bou Jeloud and the music of Jajouka. The Coptic lineage is remarkably resilient and St Mark, who founded the Coptic church in 42 CE, was the first of an unbroken succession of one hundred and seventeen Coptic popes and patriarchs. Elements of Coptic culture predate Christianity, and the Coptic language, which today survives only in the liturgy of the Coptic Church, evolved out of Ancient Egyptian and once used the pictorial writing system of hieroglyphics. Coptic theologians have also pointed to parallels between the monotheism of the pharaohs and Christianity, and the Coptic Cross is derived from the hieroglyph ankh symbol. The inherent conservatism of the Coptic Church means that its music tradition has remained virtually unchanged over the centuries and it is generally accepted that the Coptic Church practices not only the oldest form of Christian music, but also the oldest form of any music in the world. 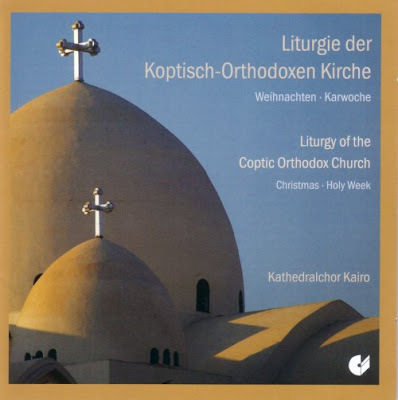 It is also thought that Coptic music predates Christianity and has its origins in the Ancient Egyptian religious ceremonies, with the distinguished Egyptologist Étienne Drioton explaining that “the key to the secret of the music of the Pharaohs can be found in a good, modern-day rendition of Coptic liturgical music. Fortunately there are several good, modern-day renditions of Coptic liturgical music available. Seen above is the recording of the Coptic Liturgy for Holy Week and Christmas made by the choir of the Coptic Orthodox Cathedral in Cairo. This is ear candling music par excellence: the music editor of the Coptic Encyclopedia Marian Robertson Wilson describes how “a non-Copt exposed to these melodies hears unusual nuances of pitch and rhythm organized in ways never before known… it is akin to being immersed in the sounds and logic of a strange and foreign language” and reminds us that “Coptic music - like all language - is basically sound moving through time”. When the poet Ted Hughes wrote about the sounds far beyond human words that open our deepest and innermost ghost to sudden attention, he could have been writing about the sounds of both the Jajouka masters and the Copts. What makes these ancient music traditions particularly valuable is that not only are they sound moving through time, but they are also perennial wisdom moving through time. In Morocco a chain of transmission links the Jajouka musicians to Ancient Greece, than on to Sufism and, via Rolling Stone Brian Jones, to a music tradition that remains vibrant today. In Egypt a similar chain links the Coptic Church to Ancient Egypt and powerful practices such as Hermeticism and Gnosticism, via the early days of the Christian Church to a liturgy that is still celebrated in Coptic churches around the world. Both are important music traditions, and while the Coptic Liturgy may lack the hashish fuelled exoticism of Jajouka musicians, it is no less rich in possibilities. Also on Facebook and Twitter. No review samples were involved in the preparation of this post. Any copyrighted material on these pages is included as "fair use", for the purpose of study, review or critical analysis only, and will be removed at the request of copyright owner(s). This is where I wish you'd succumb to some sort of YouTube clip. I saw you once damned them as the last resort of the imaginatively challenged, but it's often a very direct way of sharing your enthusiasms. Won't you reconsider? Thanks for the feedback David. I must confess to not being a huge fan of YouTube (or Twitter, Facebook etc), but you are correct that, in the right circumstances, it can add value. To be honest searching out YouTube clips is not high on my priorities - writing these posts takes long enough already! But if there is something of specific value, eg a 'sample' of a specific recording or work I will try to include it. I must confess I didn't look for clips of Coptic liturgy, but I have now. As with every subject there is a mass of relevant material on YouTube, but of widely varying quality. And there do not seem to be any samples of the specific recording I have featured - which is of excellent quality. Readers can browse the varying quality videos by searching for 'Coptic liturgy' on YouTube. If any are particularly striking please share them here. Absolutely, Facebook and Twitter out for me, but I'm amazed by the rare archive footage that can turn up on YouTube. There's at least one fan, it seems, for every artist great and more obscure on the planet.